Pay no attention to flight attendant jokes you’ve heard over the years. If you have the chance to date one, don’t hesitate to book the flight! 1. Flight attendants have free or low-cost standby flight benefits to most destinations. Want a spontaneous weekend in San Francisco or Austin? Done deal. 2. People who fly the friendly skies for a living spend a lot of time away from home, so they’re very appreciative of a familiar face and an intimate evening at home when down time finally arrives. 3. 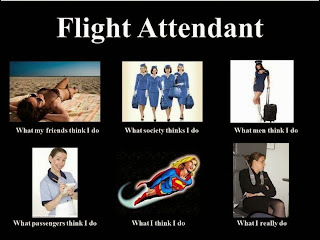 It cannot be said of flight attendants that they don’t get out much. If he or she has chosen to be with you, it isn’t for lack of other options. 4. Flight attendants are trained to stay calm in an emergency and prevent panic in others, skills that come in handy during any conflict in your relationship. 5. A flight attendant is trained to deal gracefully with all sorts of people. Meeting your parents or your best friends—and making a good impression—should be a piece of cake. 6. Someone who chooses to become a flight attendant has a proven sense of adventure. He or she is unlikely to be the wet blanket at a party—or in a relationship. 7. If you’ve always wanted to see the world, a flight attendant will make an excellent travel buddy and tour guide. 8. If you do travel together, there is no need to worry about lugging around a mountain of their luggage. Flight attendants know the value of economy when packing a suitcase. 9. Flight attendants are trained to be efficient, punctual, and organized—admirable qualities in a dating partner, especially if you’ve dated irresponsible, unreliable people in the past. 10. Dinner conversation with a flight attendant is unlikely to be boring. They have an endless supply of interesting stories to tell. 11. Flight attendants may already know that the grass isn’t necessarily greener on the other side of the country (or world), because they’ve been there. 12. Flight attendants wouldn’t last long on their job without strong people skills. Those skills are sure to enhance a dating relationship. 13. Because they spend so much time with people on the move, flight attendants appreciate dating someone with their feet on the ground. 14. Flight attendants face danger on a regular basis—which can give them an attractive zest for life. 15. A flight attendant will reward you generously for a luxurious foot rub at the end of a long trip. Bonus: They may even have an endless supply of honey-roasted peanuts and pretzels!